Chainsaw Alice in Wonderland: 10/6 is Mad Hatter Day! 10/6 is Mad Hatter Day! 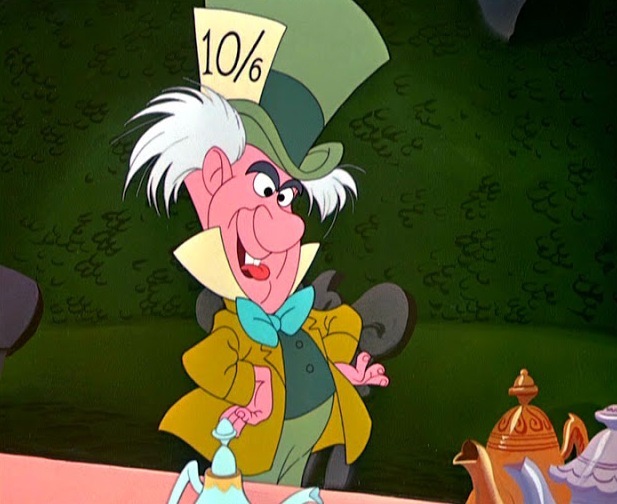 October 6th marks the holiday of Mad Hatter Day. The Mad Hatter is from Lewis Carroll's Alice's Adventures in Wonderland (though commonly shortened to Alice in Wonderland). He wears a top hat with a card in the headband labeled 10/6. In the original illustrations from the book, the card reads "In this style 10/6" and is actually a price tag that means "10 shillings and a sixpence." This is explained in The Nursery Alice by Lewis Carroll, "The Hatter used to carry about hats to sell: and even the one that he's got on his head is meant to be sold. You see it's got its price marked on it-a "10" and a "6"-that means "ten shillings and sixpence." Wasn't that a funny way of selling hats?" We have unbirthdays, I think we can have an Un-Mad Hatter Day, too! Or maybe it would be Backwards Mad Hatter Day?